Place ingredients in a spice grinder and mix until well blended. Add reserved sesame seeds and stir to combine. Set aside. Melt butter in a small saucepan over low heat. Add soy sauce and furikake. In a large pan over medium heat, add oil and popcorn kernels. Cover and wait for kernels to pop. When they begin, shake pan, with lid on, every so often. When the popping subsides, turn off the heat. Toss popcorn with butter mixture and use popcorn to garnish salad. Heat a large frypan over medium high heat. Add bacon and stirring occasionally, cook until crispy. 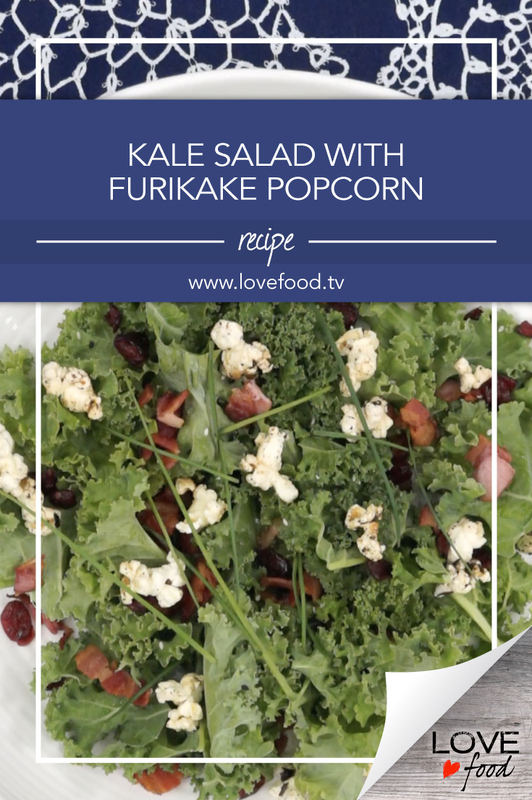 Place kale in a serving bowl and toss with bacon and 1 tbsp of the bacon drippings from the pan. Add chives, cranberries and desired amount of popcorn. Toss well and serve.